Stylish chrome floor registers have a metal, adjustable damper that controls hot or cold airflow. 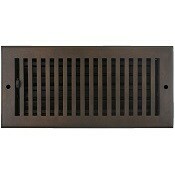 This vent cover is available in 9 sizes and can even be purchased in a matching wall vent. The chrome floor register faceplate is constructed of solid brass. These vent covers have a plated finish that matches your stainless steel and looks great in your home. Our chrome floor registers are durable and will easily withstand foot traffic. When installing the vent covers, simply drop them into your floor opening and you are done, no mounting hardware is needed. The chrome floor registers should be purchased based on your floor opening measurements. Each vent cover features a unique Strathmore pattern which will complement a variety of home decors. Note: These Hamilton Sinkler vent covers can take 10-12 weeks to ship directly from the manufacturer once payment has been received. Tip: The chrome floor registers are listed above by measurement of your floor hole opening. Do not measure an old vent cover when trying to order. A 2 x 10 chrome floor register will fit into a hole opening of that size. The vent cover faceplate will have an additional 1 1/2 inches added to the hole size measurement..
Browse our selection of other floor registers, with over 10 finishes to choose from and a multitude of styles. These chrome floor registers are also made as wall vents which come with all mounting hardware included. Our floor vent covers will look great in any room or space. Replace your basic metal floor registers with these beautiful vents today!